As we approach the end of the year, I like to look back on all the things I wrote about. I’m looking forward to 2015 because I will be changing my focus just a bit. I think I’m done talking about all the color trends and the “must haves” for the home. After doing this for 30 years, the hustle and bustle of that seems so meaningless now. My focus is and always will be color. In 2015 I will be solely talking about how to choose the RIGHT colors for your home, just like it says in my logo. Well didn’t I do this before? Well yes and no. Since I received my 2nd #Reiki Attunement my path now will be focused on how choosing certain colors for your home will actually make you FEEL good and even have strong healing capabilities. Is this legit? You bet your bottom dollar it is! Now this is key. Aren’t you tired of seeing the same color palettes flooded in cyberspace? You know the ones with the pretty picture and then the squares, rectangles or circles beside or under calling out the colors? I’m guilty of sending these graphics out too but I’ve really had enough of those. It’s time to redesign the way we look and think about color and I’m on it! Here is an example of the color palettes that I’ll be designing from now on. They will not have a picture to go with it but will have a “name” or “feeling” as the base of the design. 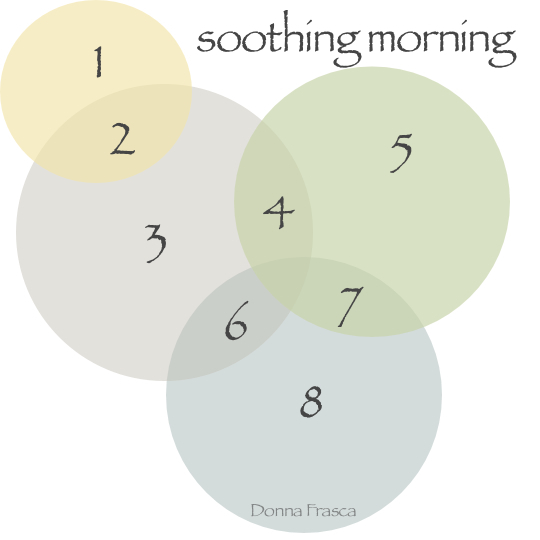 For example, here is “soothing morning” and you see, no caps are involved here. Just a soothing name for a soothing color palette. Here I have only four circles but each circle overlaps the others just a bit resulting in a new color. This is your new color scheme for an entire home. Pretty cool don’t you think? So easy to design and super fun as well. It’s designing a “feeling” instead of a color palette and this my friends, is what we should be doing! So, this is pretty big people and it took me a while to be able to put this in words. If you look at my posts for the last few weeks you’ll see that I’ve been leaking it out a bit here and there. But I can tell you this, put your trust in the people who can do this for you. It will make a difference in your life and in your home. Keep an eye out for these hashtags: #HolisticColor #HolisticHues, #BackToBasics #HealthyColor #HealingColor. If you are a Designer that is also following the Holistic path, please let me know and I’ll be sure to include you in my posts and colorful and healthy course. Feel free to contact me if you have any questions and I invite you to keep a close eye on my website. I look forward to you joining me on my #Holistic journey. This entry was posted in Color, Holistic Colors and tagged back to basics, healing color, healthy color, holistic color, holistic hues. Bookmark the permalink.